Wikipedia definition of Choreography says – Choreography is the art or practice of designing sequences of movements of physical bodies (or their depictions) in which motion, form, or both are specified. Choreography may also refer to the design itself. A choreographer is one who creates choreographies by practicing the art of choreography, a process known as choreographing. Well, choreography in literal sense means Dance Writing!! And choreographer is the one who writes the dance. Dances and music has been an integral part of Hindi films. It can be also said that some of the songs have become famous because of the dances. Lead actors, actresses, villains, comedians, all at one point have danced to the tune of the choreographers. Not to forget some of the junior artists who became famous because of the dances. Yet there are some famous personalities like Guru Dutt, Zohra Sehgal, Farah Khan, Prabhu Deva who started off as a choreographer first. Whether its a semi classical, classical dance performed by an actress on stage or a night club dance – hip hop, jazz etc or the very filmy freestyle dancing, all the dances were written by the choreographers mostly. Guru Dutt as we know made his entry in the film industry as a choreographer and hence needs a special mention in this article. Hum Ek Hain (1946) starring Dev Anand and Kamla Kotnis, was the beginning of the journey for both – Guru Dutt and Dev Anand. The song Nadiya kinare mora gaon re featuring Cuckoo is choreographed by him. But how many of us really remember the choreographers or appreciate their talent or even recognize them? We have some of the choreographers who have been featured in a song or 2 and the article showcases few such songs which have featured choreographers dancing to their own choreography. 1. Gopi Krishna – When we talk about dance and choreography, Gopi Krishna will be on the top of the list for most of us. His inimitable dance style won the hearts of many of us. Nobody came at par with his flexibility, dance arches, swiftness. Though Gopi Krishna has also starred in some of the films including Jhanak Jhanak Payal Baaje where he played the lead role, he later shifted to choreography only. Here’s one such song from Annadata (1972) where he is a choreography and he has a song featured on him. 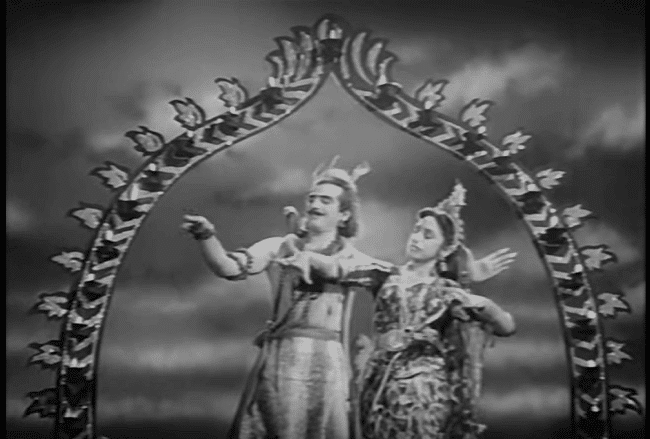 Rendered by Sabita Chowdhury and Kishore Kumar picturised on Madhumati and Gopi Krishna. 2. Sachin Shankar – He belongs to the illustrious Shankar Chowdhury family. The family which was dedicated to arts, dance music. The other famous members being Uday Shankar and Ravi Shankar. Not many know that Sachin Shankar has choreographed some of the best dances/songs from the golden era. Films like Anarkali, Nagin, Madhumati, Anand Math, Kabuliwala, Johny Mera Naam add to his repertoire of films. This particular song from Munimji (1955) a delightful number by Hemant Kumar features Sahin Shankar in the ballet as Shivji. 3. Surya Kumar – Two brothers Surya Kumar and Krishna Kumar were trained dancers. They took dance lessons from Madam Azurie (Anna Marie Gueizelor) herself a trained dancer in ballets and classicals. As the demand for dance numbers grew, these 2 brothers started off as choreographers. Early Helen numbers or Cuckoo numbers have Surya Kumar as the choreographer. This song from Love Marriage (1959) is picturised on Helen alongwith Surya Kumar. Rendered by Geeta Dutt & Rafi. 4. Azurie & Krishna Kumar – Madam Azurie was the queen of the dance screen from 1938 – 1948, after which she settled in Pakistan with her husband. She had trained 2 brothers Krishna Kumar and Surya Kumar under her wing. The 2 brothers did many films in unison but it is said that Krishna Kumar’s career was cut short after he got murdered. This was just after the completion of Awara (1951). But before that Krishna Kumar had done quite a few films and here is one such amazing song from Rattan (1944) which features Azurie and Krishna Kumar together, they also were the choreographers for the film. Song is rendered by Amirbai Karnataki and Shyam Kumar, the song is still a hit. 5. Mumtaz Ali – If we are talking about choreography we just cannot miss his name – Mumtaz Ali. An excellent dancer and actor, Mumtaz Ali had also choreographed some vintage films including the famous Achhut Kanya (1936). He also had his own dance troupe. But he went through hard times later because of his excessive drinking habit. So we have this father of the famous actors Mehmood, Minoo Mumtaz, Anwar Ali dancing to his own steps in Achhut Kanya. Music by Saraswati Devi and rendered by performers themselves Mumtaz Ali and Sunita Devi. 6. Herman Benjamin – As we shift the focus from vintage to the zany night club dances, we can very well visualise Helen in her oomph style of the 60s dancing her way into millions of hearts. Most of those jazz numbers or the western club dances were choreographed by Herman Benjamin. He was one of the top choreographers from late 50s to early 70s. His repertoire includes the unconventional numbers from Teesri Manzil, Mere Sanam, Raat Aur Din, Brahmachari and many more. This wacko number from Gumnaam (1965) rendered by Mohammed Rafi features Herman Benjamin and Laxmi Chhaya. 7. Prabhu Deva – Actor, Producer, Singer, Lyricist and a very well known dancer, Prabhu Deva, began his career with dancing. He is a trained Bharatnatyam and western dancer. His list of contribution towards Hindi, Tamil and Telugu cinema is a long one including his share of Filmfare and National awards as the Best choreographer. When it comes to Prabhu Deva, no one can forget his extraordinary rubber moves and his knowledge for rhythm. One such song which features him with Madhuri Dixit in Pukar (2000) is choreographed by him. Actress SANDHYA SHANTARAM (wife of Dada Saheb Phalke Award winner V. SHANTARAM) has also acted, choreographed and danced in V Shantaram’s ‘classic’ “Dance Musical”, “JAL BIN MACHHALI NRITYA BIN BIJLI”, 1971, with an outstanding music by Laxmikant-Pyarelal. A spectacular :MAYUR DANCE: choreographed and danced by actress, Sandhya Shantaram …in “JBMNB”..https://www.youtube.com/watch?v=L5cxSOAc5BM. “Mayur Dance” can be seen in “postlude of the song.